Drape's Takes: When Is Enough Enough? Analyzing the intersection of education and technology. My daughter (and every other member of the 5th Grade at her Elementary school) will be going swimming this week at the local swimming pool for an all-day activity. As a group. During school. In addition to the several field trips they've already taken this year. A few weeks ago, they (the entire 5th grade again) went on an over-night trip to a nearby lake. As a group. During and after school. At other schools, the scene appears to remain the same. On my recent trip to Goblin Valley (additional post coming soon), we ran into a huge group of elementary students from Provo - over 75 of them, from grades 3-5, all on a four-day, parent-free, $150 trip to Southeastern Utah. Is this an example of cheap baby-sitting or educational opportunity? These extra-curricular activities seem a little extreme to me. It's just that we never had any over-night activities when I was in ELEMENTARY SCHOOL. We also never went swimming. In fact, the closest we ever got to swimming was when we threw water-balloons during the "School Olympics" that were held on the last day of school. Perhaps I'm just a little too old-fashioned. Or experienced. 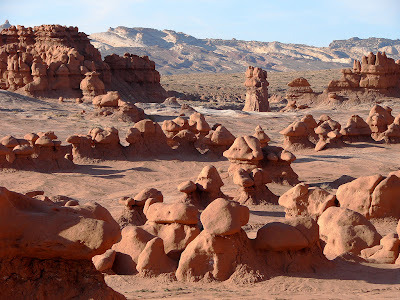 As a teacher, I can't imagine being in charge of the safety of over 75 elementary students in Goblin Valley. From broken bones resulting from jumping off of the rock formations to keeping track of the location of all of the students, this kind of chaperoning would simply be a nightmare. What sane teacher would volunteer for such work? Furthermore, what parent would trust their 8-year-old in such a situation? I have a soon-to-be-eight-year-old, and I wouldn't want him to go. Not that I don't trust the teachers (although I'm not sure I actually do - I'm not convinced I would even trust myself). It's just that the kinds of problems that could occur on a trip like this are many and varied. I'm probably over-reacting, but I can't help but question the need for such extravagance. How do you feel about over-night, school-sponsored activities in Elementary school? Are they priceless activities that shouldn't be missed or would our kids be better off if we didn't go to such extremes? An avid educational technology enthusiast, I currently serve as the Director of Education Technology for the Canyons School District (although the views expressed herein are mine alone). Husband, dad, leader, teacher, learner, presenter, tech-lover, tech-hater. Pedagogy first! That Time When Larry Cuban Ignored Copyright Law. Again? Ah, the Power of Mail Merge! What is the Purpose of IT? Rock Art or Forgetful Teachers? Are You Ready to Use What You've Learned? How Many Teachers Still Don't Know?